Door Hangers can assist you in telling your old and new customers, clients, and prospects who you are, where you are, your hours, and the products and/or services you offer. Door hangers provide an excellent advertising option that is direct, simple, and effective in reaching customers for your business. 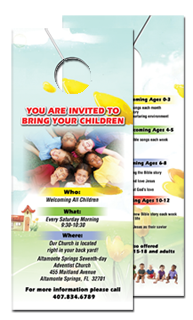 Our Door Hangers are printed in four colors on both sides (4/4) or on one side (4/0). Door hangers printed in two standard sizes. They are die cut with a hole to fit on any doorknob. For Door Hangers, please build your print-ready digital files by adding 1/16" bleed to each dimension (or 1/8" bleed on all four sides). For example, a 3.5"x8.5" door hanger with the full bleed should be 3.625"x8.625" and all the text or/and important images needs to be positioned within 1/8" from the edge of the finish piece. Please design your atwork with our templates to ensure proper bleed.